PAN HEAD: Recommended for new designs to replace round, truss and binding heads. Provides a low large diameter head, but with characteristically high outer edge along the outer periphery of the head where driving action is most effective for high tightening torques. Slightly different head contour where supplied with recessed head. See dotted line. FLAT HEAD: Supplied to standard dimensions with an 80º to 82º angle to be used where finished surfaces require a flush fastening unit. The countersunk portion offers good centering possibilities. ROUND HEAD: Not recommended for new design (see pan head). This head was the most universally used design in the past. OVAL HEAD: Fully specified as “oval countersunk”, this head is identical to the standard flat head. but possesses. in addition, a rounded, neat appearing upper surface for attractiveness of design. FILLISTER HEAD: The-standard oval fillister head has a smaller diameter than the round head but is higher with a correspondingly deeper slot. The smaller diameter head; increases the pressure applied on the smaller area and can be assembled close to flanges and raised surfaces. Headed in counterbored dies to insure concentricity, they may be used successfully in counterbored holes. BINDING HEAD (Straight Side): Most generally used in electrical and radio work because of its Identifying undercut beneath the head, which binds and eliminates fraying of stranded wire. Offers an attractively designed, medium-low head with ordinarily sufficient bearing surface. Not ordinarily recommended as a Phillips Recessed head-see Pan Head for better functional design. TRUSS HEAD: Also known as oven head, stove head, and oval binding head. A low, neat appearing large diameter head having excellent design qualities, and as illustrated can be used to cover larger diameter clearance holes in sheet metal when additional play in assembly tolerance is required. Suggest pan head as a substitute. HOLT HEAD (PATENTED): Provides the perfect tamper-proof assembly. Theft-proof — decorative, yet inexpensive. Special drivers available for field removal or power driven assembly machines. ONE-WAY HEAD: This ingenious, tamper-proof type of head, once assembled can not be removed, yet is driven with a standard screw driver. Manufactured with amazing economy in productive quantities, this simple design can frequently solve costly assembly problems. PHILLIPS FINISHING WASHER HEAD: Designed as a neat appearance product for the electronic and appliance trade with all threaded styles. 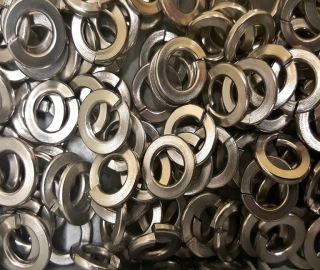 WASHER HEAD: This design has the finished appearance of a conventional round head plus washer, and was originally created to provide extra large bearing surface under the head. The modern “truss” head (carried in stock) normally answers this purpose. 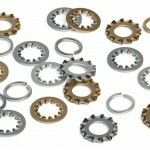 When a larger diameter is required this washer head design is recommended. FLAT AND OVAL HEADS (UNDERCUT): This is the standard flat or oval head 80º to 82º countersunk screw which has the lower one-third of the countersunk portion re moved to facilitate production of extremely short lengths. As illustrated, it will fit a standard counterbored hole and is particularly adaptable to flush assemblies in thin stock. 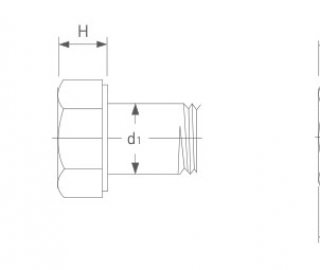 FLAT HEAD (100º COUNTERSUNK): This special flat head screw has been devel oped for applications requiring flush surfaces, and is recommended for use in soft materials, to distribute pressure over a larger and less angular surface. Very well adapted for use with thin aluminum, soft plastics, etc. 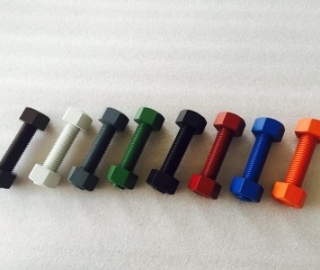 SQUARE SHOULDER SCREWS: An adaptation of the standard carriage bolt design. Possesses a truss head on a square shank which resists rotation when located or driven into place. This square shoulder may also be staked into place as a perma nent fastener. A great many varieties in all screw diameters are available in produc tive quantities. INDENTED HEXAGON: An inexpensive wrench head fastener made to standard hex agon head dimensions. The hex is completely cold upset in a counterbored die and possesses an identifying depression in the top surface of the head. INDENTED HEXAGON WASHER HEAD: Produced in the same manner as the stand ard indented hexagon head but with a washer section at the base of the head to pro tect the finish of the assembly from wrench disfigurement. ACORN HEAD (FULL UNDERCUT): A very neat appearing trim screw for appliance application — excellent wrench surfaces. HEXAGON HEAD (TRIMMED): This is the standard type of wrench-applied hexagon head, characterized by clean, sharp corners trimmed to close tolerances. 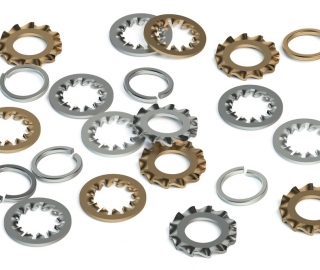 Recommended for general applications, it is available in all standard patterns and in all thread diameters. HEAD STYLES (WELDING SCREWS): The welding screw nas beenoeveloped to provide a strong. permanent threaded fastener which becomes an integral part of the assembly. It utilizes the principle of projection welding by means of multiple lugs applied to various head surfaces. Type “U” (Underlug) for general application. Assembles easily into prelocated holes and fully utilizes head strength. Top surfaces of head designed for efficient welding anode contact. Flat Head styles take full advantage of the self-centering feature of the countersunk portion and provide a smooth, flush outer surface. Type “T” (Overlug) for applications requiring smooth, finished outer surfaces. Under surface of head is designed for perfect electrode contact. 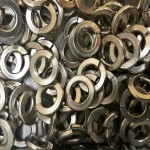 We manufacture various bolts, nuts and washers. If you are interested, please feel free to contact us.